Triggerfish Drill Sergeant is a puzzle game involving telling fish where to go, and sometimes blowing them up. If that doesn’t sound like a fun time, then what does? It’s a puzzle game! With fish! In truth there is much more to Triggerfish Drill Sergeant than just that. 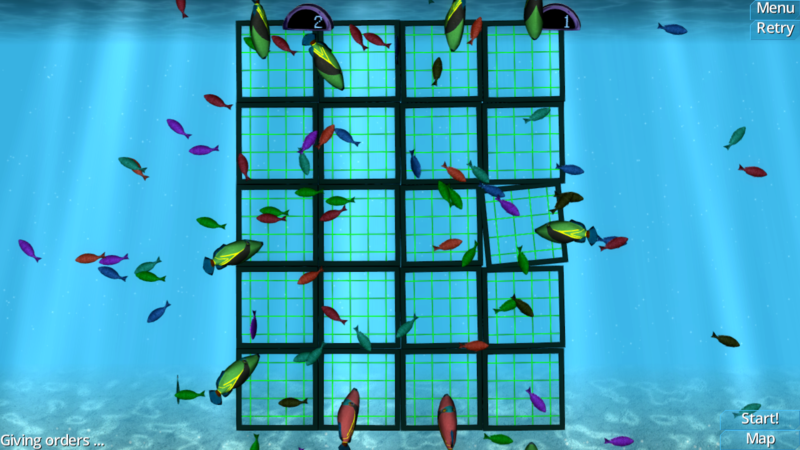 Developed by Anglerteam Games, Triggerfish Drill Sergeant puts you in control of a grid. Your goal: fill the grid with fishies to copy a pre-determined pattern of movement. To do so you have a wide variety of fish types to choose from along with other handy dandy tools like torpedoes and depth charges, because sometimes a fish just has to die to reach your goals. Mechanics-wise the game tries to come off as a love child between Lemmings, Pipe Dream, and a block-sliding puzzle. You place fish, obstacles, and things that go boom strategically around the board so that the fish you want to succeed in duplicating their pattern bounce about in the correct order. Gameplay-wise, the game is a simple point and click affair, though impressions from screenshots and videos are of a user interface that is somewhat less than intuitive. Take charge of your troops, from the raw recruits to the battle-tested veterans. Lead them through drills and navigate through parade grounds to prepare for the horrors of war. Press on as your troops forge past missiles, lasers, and ruthless killers. Troups, parade grounds, etc. all boils down to fish, though in the case of puzzle games there have been far more confusing and less sensical comparisons made. Triggerfish Drill Sergeant is available now for the low, low price of $4.99, with versions available for Windows, Mac, and Linux platforms. There is even a demo available if you are so inclined.